This pattern is available from etsy.com for €2.00. 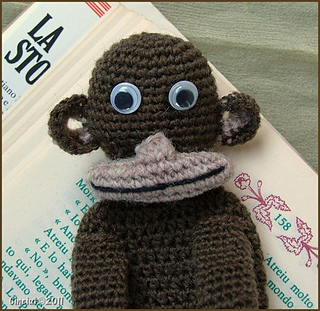 Amigurumi Crochet pattern – instructions to make a Monkey bookmark using 2mm crochet hook with amigurumi technique. 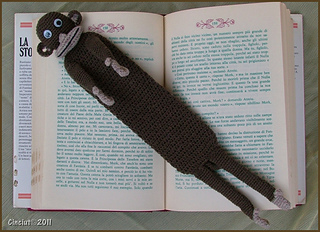 The finished bookmark is around 32 cm long from head to paws. 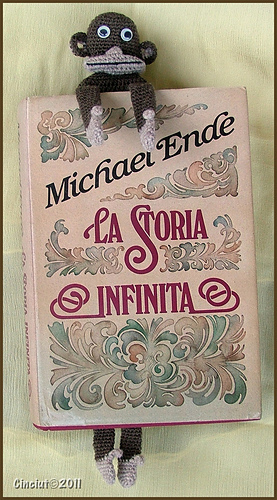 The size of the bookmark depend on your gauge and your choice in material (Yarn, Crochet hook). PLEASE NOTE that this is NOT a FLAT bookmark so when you close the book with the bookmark inside, it will give some thickness and the book won’t close perfectly. The thinner is the yarn the smaller will be the thickness, dimension of bookmark will vary upon your gauge and yarn used. You can change body length for small or big book. All my patterns are copyrighted so please use them properly.